Pears are often overlooked for novel or exotic fruit and I reckon it’s because we’ve lost the art of ripening them and we’re eating them hard. We want everything ready NOW, but pears, just like avocados, can’t be treated like that. 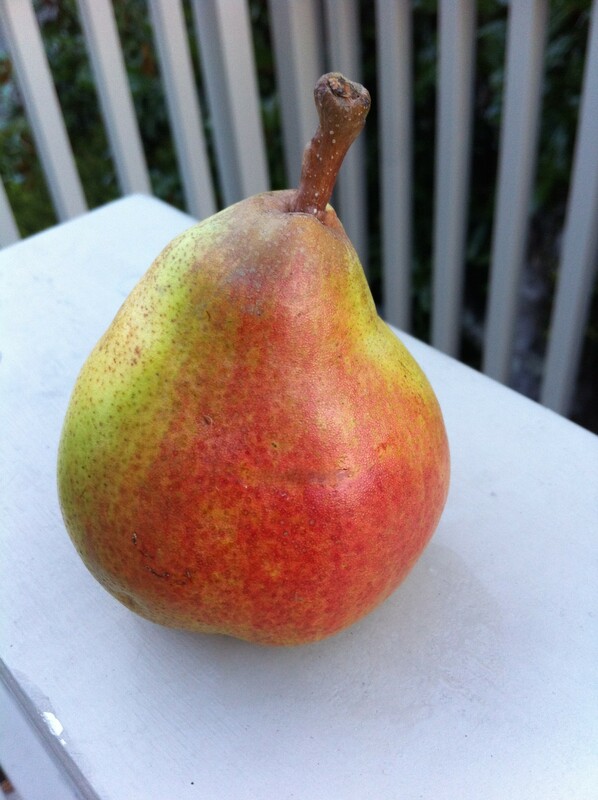 Pears are ready and at their best, when they are ready and at their best, if you get my drift. So don’t kid yourself when you buy a rock hard pear from the supermarket that it is going to make tasty eating in a day or two. It won’t. An unripe pear is a bore (it’ll most likely be woody, gritty and dry) but ripen a pear at room temperature – and it pays to know that a pear ripens from the centre – and you unlock its beauty. A good pear will become fragrant as it ripens, smelling of sweet pear drops, the very essence of pears, and its flesh will become juicy, melt-in-the-mouth buttery or velvety, and sweet. Gorgeous. Simply gorgeous. But it takes time for this to happen. You can put a few feijoas or a banana in the fruit bowl with the pears to help speed up the ripening (they both give off ethylene gas), but check the progress every day because there’s nothing worse than nurturing a pear to near-perfection, forgetting it for a day, as you do, then finding that the blighter has started to rot. Dang! So we are talking ripe pears … what’s not to love about them? Cute little honey sweet pears blushed with red and dotted with freckles, dumpy looking Doyenne du Comice with their hints of spice and gorgeously buttery texture, sweet and juicy pink-tinged Conference pears, and Beurre Bosc with their long tapering necks. Pears that smell of pears! And if you need another reason to eat them besides their lusciousness, you’ll be pleased to know pears are a good source of antioxidants, and contain potassium and significant amounts of calcium and phosphorus. Using them in savoury dishes helps get more of them in the diet. Yup. Savoury ways are good. *Try brown bread slathered with creamy blue cheese, sliced ripe pears and a drizzle of pomegranate molasses for brunch, lunch or snack time. *Thinly slice trimmed fennel and dress with a creamy lemony vinaigrette, toss through sliced ripe pears and top with sliced rare-cooked duck breast. *Panfry chicken breasts in butter, then when nearly done add quartered peeled pears and plenty of fresh tarragon, cook a few minutes, then splash in a little verjuice. *Make a crumble with pears and blackberries (you can use frozen ones) adding chopped toasted hazelnuts, lemon zest and a sprinkle of cinnamon to the crumble. Doyenne du Comice A big mamma of a pear hailing from the pretty region of Angers in France. It’s aromatic and has a sweet spicy bite with soft buttery flesh that melts in the mouth with nary a chomp. Oh, and the juice, it’s everywhere, down the chin and the wrists. It’s a slurp-a-fest if ever there was one. Don’t ever think about cooking this beauty. Packham If you get it bang on the nail, this fragrant pear has good textured smooth flesh and is nicely juicy but it’s not so soft that it will collapse when tossed gently in a salad. It also responds well to a quick sauté in browning butter on high heat. A reliable pear that ripens easily. Beurre Bosc Another enjoyable eating pear, with soft buttery flesh. A good one is aromatic, but some can be gritty near the core. Winter Cole An old New Zealand favourite, and the one I choose when making pears in red wine as even hard pears submit to tenderness with gentle poaching. They also hold their shape well after cooking and the stalks stay attached. I have to confess to not bothering much with this variety as an eating pear. Winter Nelis Often known as winter Nellies, with their sweet and spicy little nip, are usually a bit juicier than Winter Cole, and are good for both eating and cooking. Louise Bonne de Jersey These look gorgeous and can be sensational to eat – but you have to strike them just right. Don’t use these as cookers. William Bon Chretien Commonly known as the Bartlett pear thanks to Enoch Bartlett who took it to America. It can develop a wonderful musky fragrance, and the flesh is juicy and velvety. It’s a great eating pear but also good in quick-cooking desserts. Taylors Gold When ripe these pears are nicely soft and buttery, aromatic and sweet and juicy.